I was originally planning on running the Rockin’ Marathon Relay again this year, which was scheduled for this weekend. However, a month or so before the race, they cancelled it due to lack of participation. Thus, I scrambled to find another birthday weekend race. It’s a popular weekend for races because of the cooler weather, but, ultimately, I chose the Hammer Down because the charity they were supporting was Our Kids, who provide counseling and medical evaluations for victims of child sexual abuse. They also had an appealing downtown 10k option. After my disappointing 10k in September, I decided I would try again. I didn’t plan on racing as hard as I had planned to race that one, but I did want to attempt a PR at the very least. This race happened right as our first cold snap of the season came through. 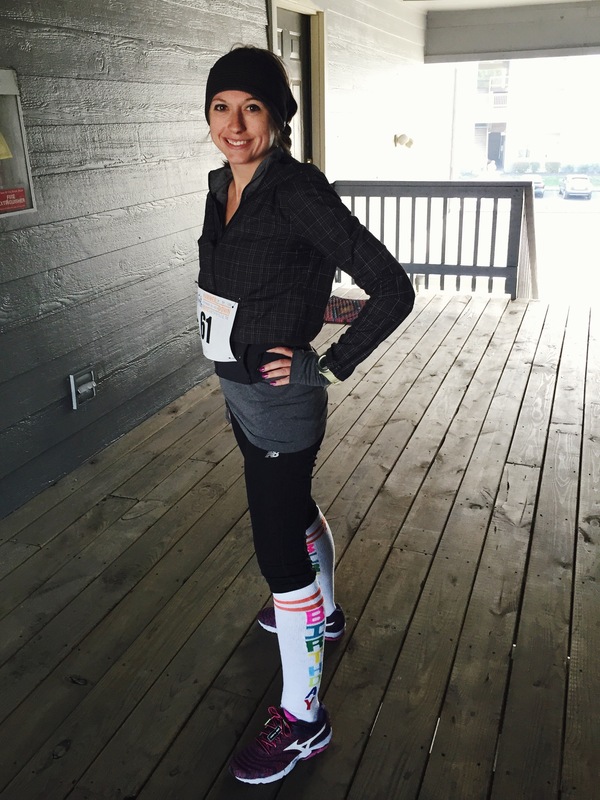 It had been in the 60s earlier in the week, but was below freezing the morning of the race. Brr! 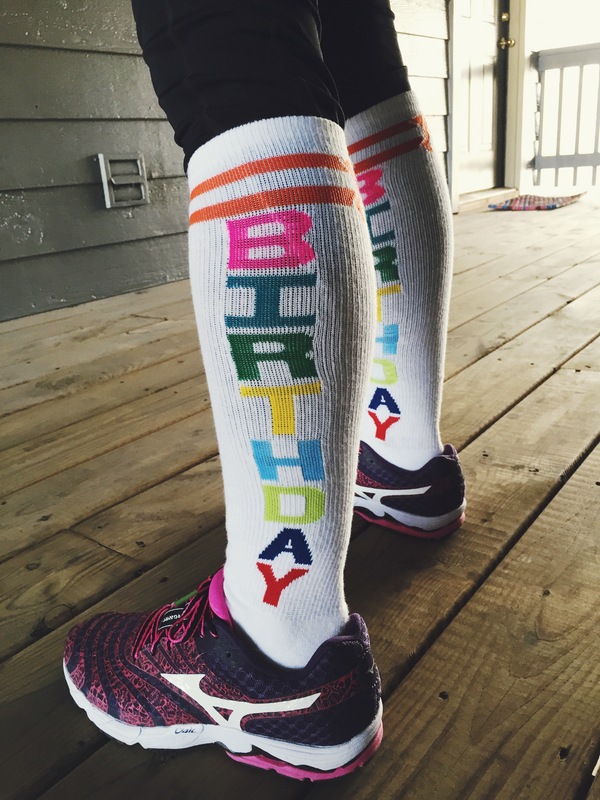 I bundled up with a half-zip, jacket, tights, and some fun birthday socks that I had bought for the race. I got to the race fairly early so I could get a parking spot before they closed down the streets for the kids’ 1k race that started at 7am. It was freezing out, but they nicely had some portable heaters out so we could try to keep warm before the start. Tearing myself away from that heater to head to start line was the hardest thing ever. This wasn’t a big race, so there was a pretty small group at the start (only 129 finishers between both the 5k and 10k). Most of them were faster than me, so, of course, I started too fast. Meaning, I was running at an 8-9 min pace before a hill finally slowed me down to a more reasonable speed. Also, my car key fell out of my pocket right after the start of the race. (I had unzipped my pocket to put my hand in to keep warm and forgot to zip it back.) I heard someone say something about a key, but by the time I realized it was my key, I was like, “Eh, someone will pick it up and turn it in. I don’t want to stop running to look for it.” Yes, I am that trusting of people. I don’t remember anything remarkable about this mile. I just tried to maintain a steady, comfortable pace. I wasn’t pushing at all. We passed the first water station, so I took a quick walk break. My fingers, which had been frozen the entire first mile, started to thaw out towards the end of this mile. Another comfortable mile. The people at the second water station wished me a happy birthday. While I had been grumbling to myself the first two miles about not wearing gloves, by this mile I was happy that I hadn’t. Around the halfway point, I finally looked at my watch and started doing calculations in my head. Yep, I was probably going to PR. I decided to push a little to see what I could do. There was a guy who had been running about a quarter mile ahead of me the entire time. I made it my goal to catch up with him. I passed him on a hill at the start of the fifth mile. He said, “Wow, you’re just floating up the hill!” and I thanked him for making me run faster so I could catch him. I continued on and passed another guy. I decided to give my all on the last mile. I passed two more guys, and I was trying to catch up with a woman who was ahead of me (just in case she was in my age group), but she turned her speed on as well, so I never did. I had been so steadily increasing my speed over the last mile that my sprint in didn’t even really feel like a sprint. As I got near to the finish line, I was in complete shock to see the time posted was an hour and one minute. I really hadn’t been paying close attention to my watch at all. I gave one final push to get in before the minute clicked over to two. I cannot believe that I ran a 10k that fast. It surpassed all goals that I had set out for my September 10k. I had no idea I could, and I definitely wasn’t really trying to starting out. I ran pretty much the whole thing, only taking four brief water station walk breaks to make sure I stayed hydrated, and I felt strong the entire time. After crossing the finish line, I grabbed a water, some chocolate milk, and a banana. I ate my banana, then found some official looking ladies. I asked who I need to talk to if I had lost something. One of the ladies said she could handle it, so I told her about my car key. She went and asked around and came back with it! See, I knew someone would find it. The guy who I passed after mile four came up to me to tell me good job. He said he tried to catch back up to me but couldn’t. This was the inaugural year for this race, and I think they did a good job! The course was well marked with lots of volunteers and well spaced-out water stations. There wasn’t a plethora of goodies at the end of the race, but that’s not something I expect of such a small race. The goodie bags had some nice things in them like Mary Kay hand cream and Chapstick. The shirt was a long-sleeved tech shirt, which was nice, but I don’t think they were gender-specific, as the small was enormous on me, unfortunately. I don’t see myself running in it. There was a finish line video posted to the website, which I thought was cool, until I saw that it cut off 10 seconds before I crossed the finish line. What’s up with that?? They did announce your name as you crossed, which is always a nice bonus. Photo posting has been a little slow. (I delayed this since I thought they were going to post them soon after, but it’s been nearly a month, and I haven’t seen any yet.) But they are free photos, so can’t complain too much. I was generally happy with what I chose to wear that morning. Yes, a pair of gloves would have been nice for the first two miles, but I didn’t need them after that. I may look into investing in a few pairs of cheap gloves I can toss in situations like this. As for my performance, I couldn’t be happier! Check out these charts. This one shows the percentage of time I spent running at certain paces. Note that I spent over 40% of my time at 5k pace. This may mean I need to shift my pace zones down a bit, which means I’m getting faster! I’m waiting for the day when something appears in the “I can’t run this fast!” zone. This one shows my 5k splits. I ran the second half sub-30! My 5k PR is 29:14, and I was only 18 seconds off of that in the second half of a 10k, which is crazy. I also ran my fastest mile ever in 8:46.